This is kind of cute, but I don’t think I can justify it. 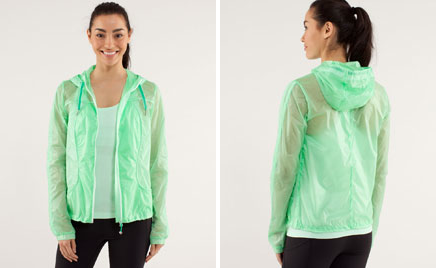 Back in 2010 Lululemon had a similar sheer windbreaker type jacket and it was quite overpriced at $120 (around that price, possibly more or less). It ended up going to markdown to $19 and I still didn’t pull the trigger on it. If this one gets significantly marked down I’ll probably get it, but not at full price, whatever that may be ($108).